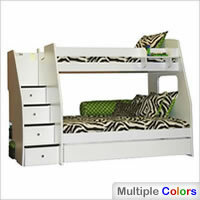 Weight capacity for top bunk: 250 lbs. 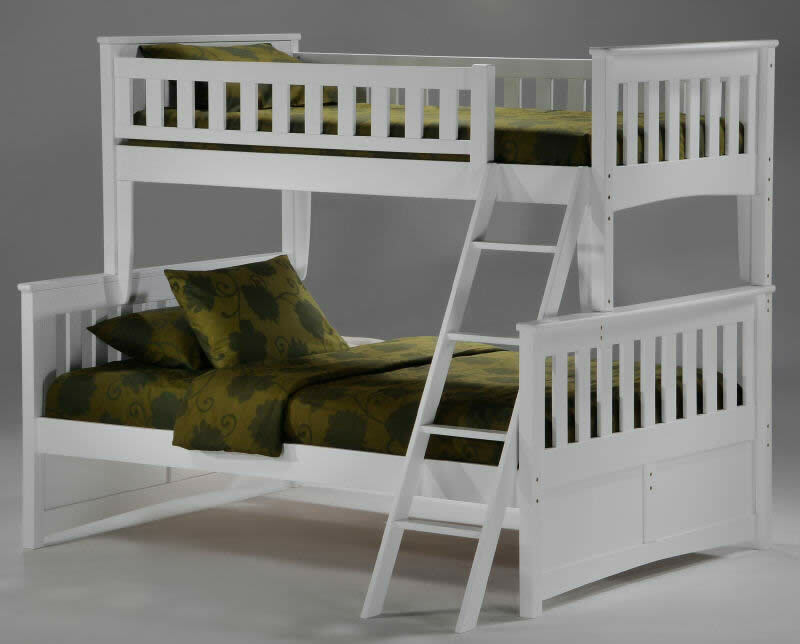 The Ginger Twin over Full Bunk Bed from Night & Day Furniture blends quality and practical usefulness in a stylish, eye-pleasing package. The design has a contemporary feel to it, with straight lines and vertical slats that are reminiscent of mission styling, and only a very slight curve at the lower end of headboards and footboards to break the monotony. 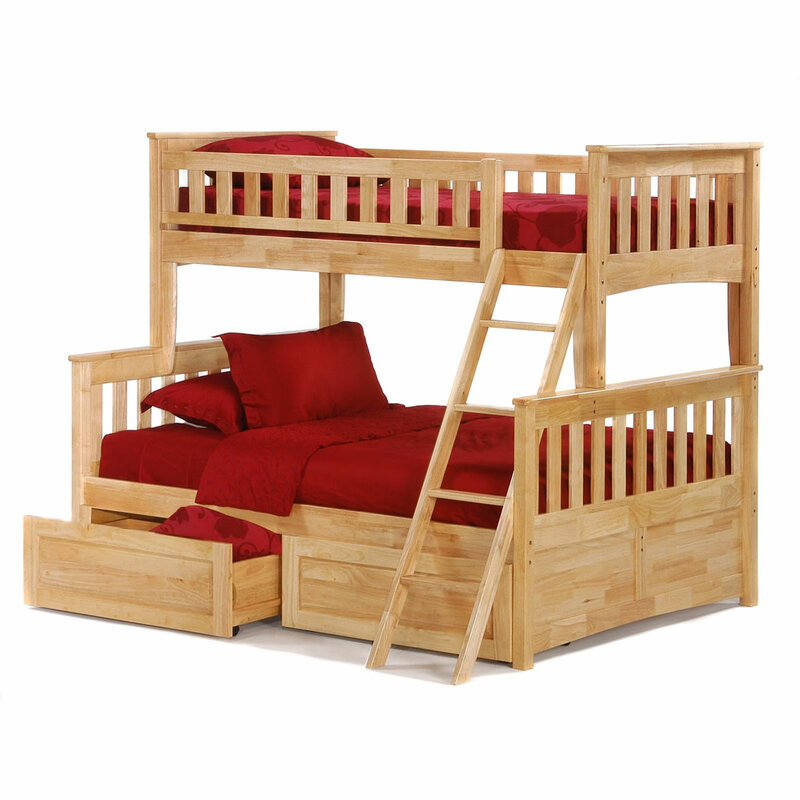 The bed is made of Asian rubberwood, a material that has recently been embraced by many a furniture manufacturer. Rubberwood is valued for its attractive color and acceptance of different finishes, but even more for its dense grain and minimal shrinkage -- two qualities that are crucial for sturdiness and durability of any given product. 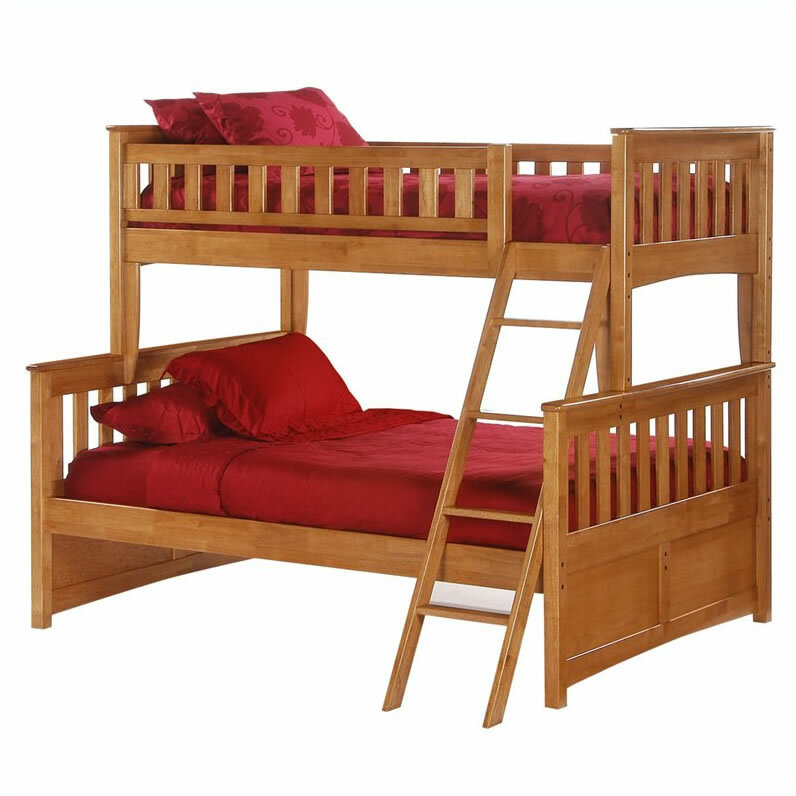 The Ginger Twin/Full Bunk Bed is also quite versatile; it can be separated into individual beds which is a feature that comes handy in many situations. 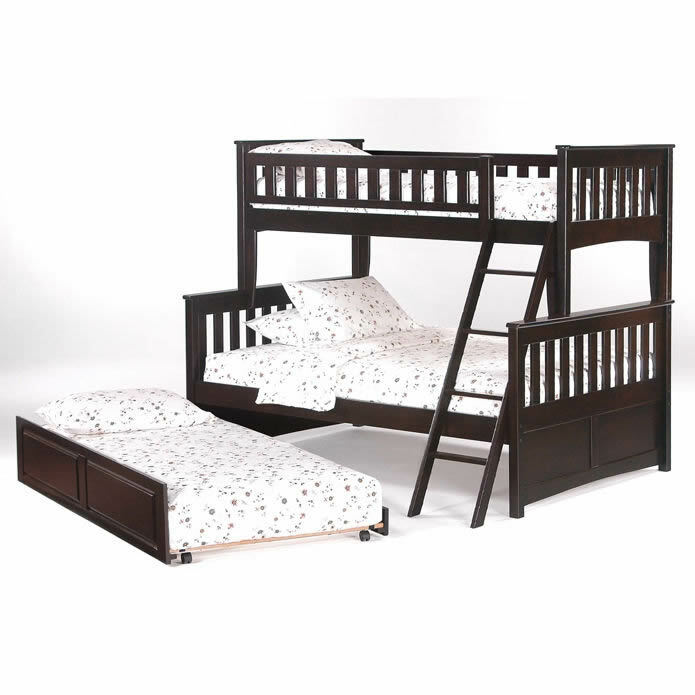 For example, you may have two smaller kids who are not ready for a bunk bed yet; or, you may have two kids who share a room but you plan on getting each of them their own room later on -- the splitting feature is a godsend in both cases. 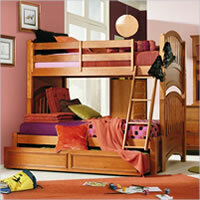 The bed also accepts the optional trundle bed or storage drawer set for additional sleeping or storage space. Read on to find out what actual users have to say about this product. 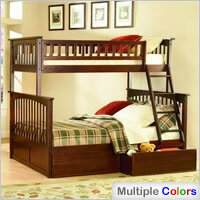 Durability -- according to the buyers, what we have here is one sturdy and solidly built piece of furniture. Very solid and heavy product; extremely sturdy; well designed; solid and durable; excellent quality -- you can find plenty of generic praise like that (it gets quite repetitive, really), but there are also a bit more colorful expressions: bolted and secured like a fortress, is how one reviewer put it. What's interesting is that the praise is very often followed by an amount of incredulity; people seem to have a hard time believing they got themselves a product of this level of quality for the price asked -- bunk beds of similar standing are reported to go at twice the amount at local stores. Along with the craftsmanship, it is the material that gets the most commendation; while some seem to be impressed merely by the fact that the product is all made from real hardwood, others do also notice its qualities: beauty, strength, heaviness. 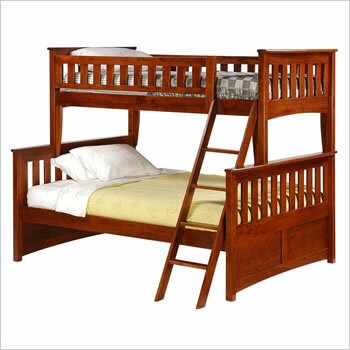 Ease of assembly -- you shouldn't have any problems with putting this bunk bed together, at least according to the majority of reports out there. The product comes with assembly instructions which are described as straightforward and easy to follow, and that should be true even for people with little or no DYI experience. In fact, there is a user out there who effectively described herself and her husband as total morons when it comes to building things, yet this major piece of furniture only took them about two hours to assemble. Not much to report in this section. There are a (very) few complaints about missing hardware; lack of bolt covers/wood plugs; missing paperwork (instructions, warranty). Then, this wouldn't be a Night & Day bunk bed if there weren't a few laments about stickers that are hard to remove. That noted, you should be aware that these stickers contain safety information and that the manufacturer is actually obliged to put them in a conspicuous place where they are in full view. And they are very sticky because they are actually not supposed to be removed. 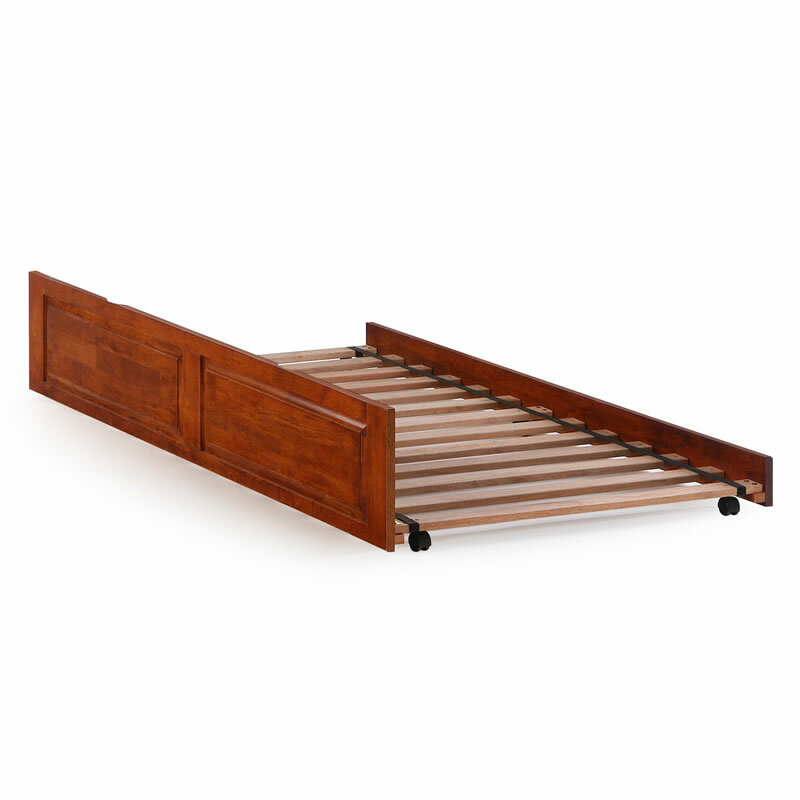 The most often repeated complaint about this bunk bed comes from those who have purchased the under bed drawers; namely, once in place, the right drawer can't be pulled out without removing the ladder first. We'd classify this as a slight design flaw which could easily be rectified by utilizing a clip-on ladder that doesn't reach all the way down to the floor -- but then, the people at Night and Day have surely thought about this possibility and probably have their reasons for not implementing it.